Want to know how a marketing virtual assistant can free up 10 to 20 hours per week of your time? Imagine being able to let someone else take care of all those time-consuming marketing tasks so that you can focus on doing the important things in your business that only YOU can do. In this episode, we share 20 marketing tasks that you can outsource to a virtual assistant. Anf: If you want to have your review read out in an upcoming episode. Make sure you head over to founders connect.co forward slash review and leave us a rating and review. Be honest and give us some feedback on what you think. And yeah, we can only improve the show based on what you tell us. Exactly. Cindy Pham: Welcome to founders Connect podcast. We help lifestyle entrepreneurs to grow their business online and create a happier marriage. Cindy Pham: Each week, we bring you an inspiring guest and practical tips to help you with business relationships and sustainable living. Cindy & Anf: Now let the fun begin. Hi I’m Cindy Pham and I’m Anfernee Chansamooth. We’re from founders Connect. 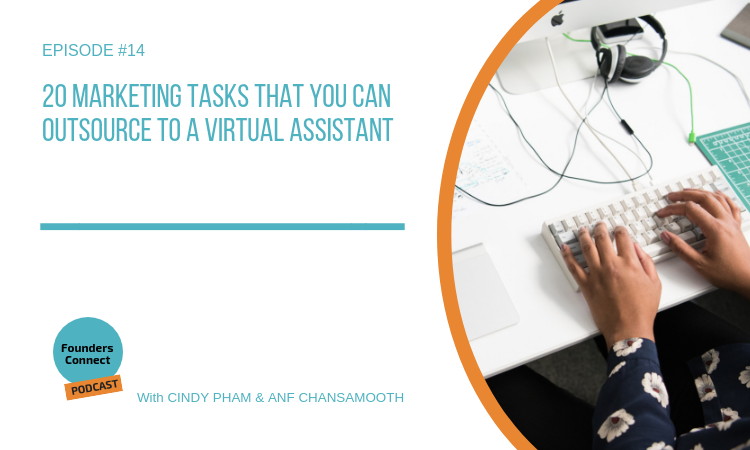 And in this episode, we are talking about 20 marketing tasks that you can outsource to a virtual assistant. And why would you want to do that? Cindy? Why? Oh, for traffic for traffic and with traffic this business with no traffic there’s no business that’s right. So if you’ve got something great to offer product service or some really cool things on your site, but no one’s coming to your site, then that’s going to be a major problem for you. And you won’t be able to have a growing or sustainable business. And that’s going to be time. So the other issue that a lot of business owners have and founders have is that marketing can take a ton of time, like they actually spend 20, 30, 40 hours a week doing things like social media and posting things online and sharing and promoting content and that takes them away from what they really need to be doing, which is finding clients speaking to clients, having sales conversations and selling and also serving and delivering the service to the client. So we basically launching a new project called Virtual traffic engine, that Cindy’s baby and that’s a virtual assistant support service to help entrepreneurs grow their traffic online and within that there are 20 different tasks that you really need to be thinking about outsourcing, what are those tasks Cindy? Cindy Pham: Well what we did was we categorize those into four categories to make it easy for you. The first category is social media support and in the social media support: number one create social media graphics. Number two is creating a content schedule so you know what content you need in advance and can prepare for it. Anyway, number three is scheduled posts on social media. Number four is curating content for social media which basically means that you have someone researching finding out and re sharing other people’s expert content out for your own social media channels. Yes, and please don’t confuse that with creating and writing and number by social media engagement. For example, commenting on other people’s posts and replying to comments as well. And that can take a whole bunch of time if you try to do that yourself. Isn’t it Cindy so much. time going through it and then finding some way to think of replying like the clients thoughts. You know, that’s a good objection you bring up because it is possible to train or work with the VA who can do that and still represent your brand. Even if they don’t speak like you’re necessarily true. But I have to have this lamb values and thoughts for your brand, actually. So you have to make sure that you’re hiring the right person. So the next category is as a support. So what’s SEO support, darling? So SEO is search engine optimization. There are things you need to be doing on your website and also off your website to make sure that your site is ranking well for specific keywords in search engines like Google ok ok, so number seven SEO keywords. Research seo keyword research is basically having someone go and find relevant keywords for your industry or subject matter so then you can actually create your content based on that. And I’m going to be talking more about that in upcoming episode and number is optimizing SEO for blog posts so that you do on your actual website platform and we use WordPress. That’s right. So whenever you’re posting a new podcast episode or new blog post on your website, you want to make sure that it is optimized for search engines so that content can be found. Okay, task number nine you can outsource is identifying and submitting your website to urban online directories because you also want to have a bunch of links coming from other apps external websites pointing to yours. OK, Google likes that that’s bringing awareness to your brand. So the next category is podcast or blog support and number 10 is researching potential experts to contribute to your blog or podcast content. Narrator: You are listening to the founders Connect podcast, helping lifestyle entrepreneurs to grow their business online and create a happier marriage. Now back to the show. and 14 is transcribing podcast audio. 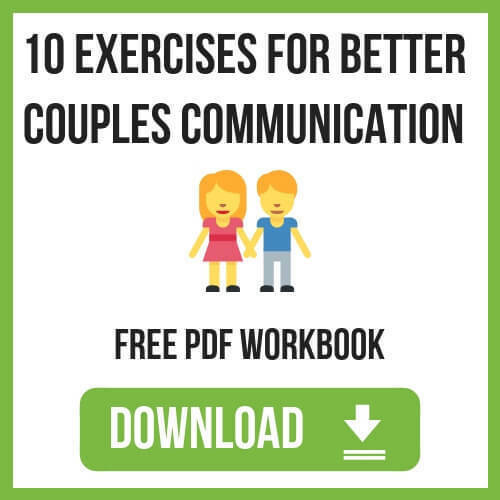 This one can take tremendous amount of time as we have experience because we’ve been doing it and having someone else take care of that will easily free up couple of hours of your day just doing that task. It’s really good again for your SEO as well to have your podcast audio or your videos transcribed and sitting on your website is to create show notes for the podcast. So once the transcription is done, or even if you’re not doing transcriptions, that’s okay, but you want to then have someone listen through your podcast, audio or video content and and actually extract key points and key quotes that can be used for show notes on your website. Exactly. number 17 responding Comments. So this one is probably not a big deal in 2019 as it was a few years ago. Because people tend not to put too much on blogs now. But if you do have an active blog, then you if there is anyone responding to commenting on your blog, you want to make sure that you do have someone like a VA responding to them, so they feel like they’re being heard. number 18, repurpose in audio content for social media, like LinkedIn, Instagram. So there’s a good example of this. If you take a look at any of our podcast episode sitting on our website, and you can just go to founders connect.co forward slash podcast who each episode we do, we will also create like an audio snippet, which is basically a little video which runs for like 30 seconds or 15 seconds. And that goes to Instagram stories and also goes to LinkedIn. And that’s a really nice way to take your audio content and put it in other places on different platforms so you can then drive traffic from those platforms back to your website and that’s a massive center badass a lot of people do that and that’s a really good point Cindy because many people are not doing that. So that makes you stand out automatically. Exactly. So watch out for that one. Number 19 creating PDF worksheets for content upgrades. So specific to where you’re doing blog posts or you’re doing podcasts you want to make sure you have relevant sort of worksheets or guides or ebooks or whatever it is I recommend worksheets could they quick to produce and for the reader or the listener it doesn’t take them a lot of time to just download a one page worksheet and it they can work for it right yeah, so basically we did that in our founders Connect episode for for Tara we created our own worksheet just based on the summary of her strategy and the worksheet is called Community strategy worksheet and have a look. Yeah, so if you go to www.foundersconnect.co/004, you can go and download that worksheet there and you can see exactly what we created so the last categories self support, it’s quite poor listener, this is a huge one. And even though we started this episode off by saying that you want to hire a VA or outsource a lot is marketing tasks to have a stack of free up to do your sales process a VA can be very integral in supporting you with that sales process. And sort of a couple of tasks here, like task number 19 is LinkedIn outreach. Okay, so you really don’t want to be the person sitting there sending Connect request to 50 or hundred people a day. Like that’s just not the best use of your time. But you can certainly have a marketing VA do that for you. Exactly. And it takes the top off to actually if they do it. Yeah, I just want to clarify what this means is actually you give them certain criteria of who you want to be connecting with, but that could be your ideal buyer or ideal strategic partner, right, you give the VA the criteria of who you should be connecting with, and then they can go away and send those connection request for you. Exactly. number 20 and final one is follow up and setting up appointments with the leads that’s pretty straightforward isn’t it is straightforward is also a process behind that. So it’s not just like send a connection request and hey, you want to jump an appointment with me like that’s not the best way to use any social media but your VA can be a critical part of that administration work to actually once the connection has been made, then you know, you can follow a series of private messages to build a relationship with that person, establish trust, and then when it’s appropriate, you can then have your VA invite them to join a call with you and move the relationship forward. That’s our 20 marketing tasks to outsource. All right. And so we’ve actually put together a consolidated list of only 20 tasks for you into a checklist, which is an outsourcing checklist if you want to go and grab that will put a link to that in the show notes for this episode. 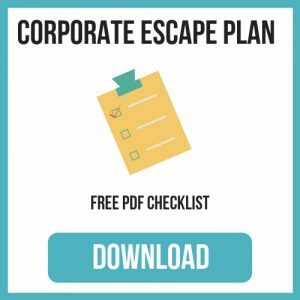 So just head over to www.foundersconnect.co/14 to grab that checklist. in this week’s community corner we have a question for Ryan, one of our members from founders Connect group. The question is What motivated you to start a podcast? Were people asking for one or was it the next logical step for you? So should I start a show us that I think you can start Cindy Thank you. Your palming it to me, my darling. Well, my motivation for starting this podcast was actually trying to help couples who are entrepreneurs, entrepreneurs like us that’s going to maybe some of the problems that we have gone through and to help them out with those problems. habits of just bottling up and trying to find in my head a solution for us hints. That’s how founders Connect started in that area. And because I am not good at writing, better at talking, but not that great at talking about better at talking. So that’s the reason why it’s better for me to do a podcast. Yeah. And many people have given us feedback that they love our dynamic. And I think for us video and audio is the best way for us to actually show that dynamic because in the written word that doesn’t really translate well. And it’s easy for us to pick up a microphone and just talk about things because we talk about things anyway. So why not just put a microphone record the conversations? Yes, we have so much meaningful relationships and we’ve been told to leave this library that we’re in and recording now. So that’s it. Thanks for your question, Ryan. And if you have any questions for us, let us know and we will answer that. and remember to live passionately purposefully as competently till next time.